A small piece on the BBC News website got me thinking. 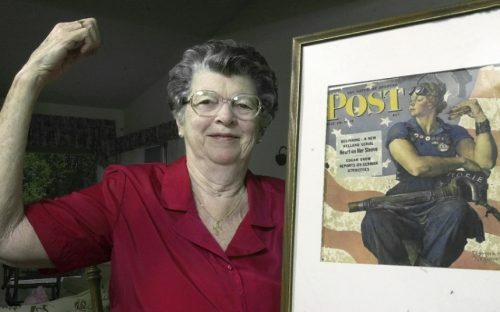 It was an obituary to Rosie The Riveter. The famous Norman Rockwell painting of a woman doing her job for the war effort. Often confused with the other iconic image, We Can Do It. When artist Norman Rockwell painted the iconic picture, Rosie the Riveter (not to be confused with We Can Do It), he took as his model a 19-year-old telephone operator named Mary Doyle. The painting, which appeared on the front cover of the Saturday Evening Post in May 1943, quickly became a symbol of the millions of women doing war work while their men were at the front. Over the years it has been adopted in various guises as a tribute to feminism. Doyle was paid $10, roughly $140 (£93) in today’s values for two days of posing for Rockwell’s photographer. The painter later apologised for bulking up her relatively petite figure to give the picture more impact and described her as the most beautiful woman he had ever seen. Doyle was the daughter of a Vermont logger who went on to graduate as a dental hygienist. The original painting sold in 2002 for $5m (£3.3m). That short obituary of someone we have never heard of but who’s image is so engrained in the American psyche got me thinking. Women working in industry wasn’t a new thing as it happened in the Great War of 1914-1918. When the men returned home, the women returned to the kitchen and the children whist the men took their jobs. Nothing nearly happened with women in industry since the start of World War II in 1939. It exploded in 1941 when America got involved. There are some great images of women at work. Be that on a small lathe making a “widget” to riveting a wing of a Flying Fortress. All looking fabulous in their overalls and hair covered in a scarf. It wasn’t just working in the factories making planes and bullets that women helped with. It was making the trains run. Being guards on the train, being the porter on the station, working the signal boxes. It seemed they did everything apart from driving the actual train. All countries ran their own propaganda, sorry public information, departments to help the public. From the classic British campaigns of Make Do And Mend to Dig For Victory to the US’ We Can Do It. The latter helped get more women into the planes and bullets side of the war effort.